Just like great Mexican food, this Mexican cookbook begins at the source: classic recipes, bold flavors, and fresh ingredients. Unless you live in a city known for its Mexican food, finding good Mexican cuisine can be challenging -- and finding the right Mexican cookbook might be even more difficult. For food writer and cookbook author Jennifer Olvera, cooking traditional Mexican meals began as a labor of love. As a working mother of 2, she wanted to recreate the traditional recipes she saw flowing freely at family gatherings, but also knew that spending hours in the kitchen wasn’t practical. 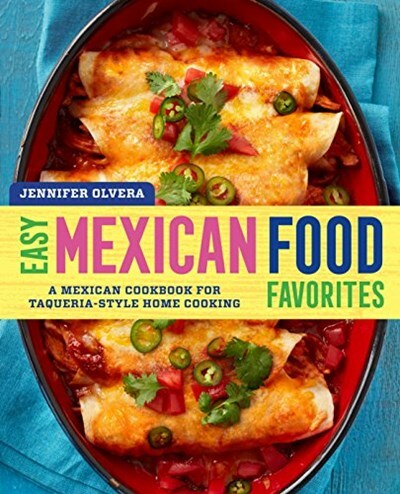 In Jennifer’s first Mexican cookbook, Easy Mexican Food Favorites: A Mexican Cookbook for Taqueria-Style Home Cooking, she shares the Mexican cooking secret she finally discovered -- all you need to enjoy delicious Mexican food at home is some simple techniques, time-saving tips, and a gradual, acquired instinct. Easy Mexican Food Favorites: A Mexican Cookbook for Taqueria-Style Home Cooking brings you all the Mexican food you love without all the fuss. Whether you’re in the mood for salsas and tamales or enchiladas and horchatas, this Mexican cookbook has everything you need to get started.